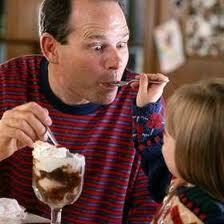 Amusing Kissa of Dad, Hair and Ice-cream!! On father’s day, I was on a memory trail about the incidences with my beloved Dad. There are so many noteworthy of but I came up with this rather amusing memory till date. Hope you have fun reading this!! I have always wondered why should my emotions be so inextricably tied to my HAIR, I don’t know but it is a fact that a good haircut can uplift my spirits for a month, while a terrible one has left me in tears so many times. When I was seven, my mother persuaded me to get a “bob-cut”. Unfortunately, this turned out to be the code for what you might recognize today as the ala Mandira-Bedi-haircut. That was a time when there was just no access to a talented hairstylist. Short and extremely unfussy, was IN then and my in-all-directions-heading-curls had to be toned down because they warranted a hell lot of attention. The only people who ever complimented me on the results of that disastrous trip to the salon where my mother, the nice Chinese lady who had followed my mother’s instructions against her own better judgment, and a teacher of mine who sported that exact same boxy cut. I don’t know why she stuck my dad with the job though. Maybe she felt it would be a waste of money to take me with her to the ladies salon where they had things like proper lighting? Maybe my dad offered like the responsible parent he is? Who knows! But I ended up accompanying my dad to the barbershop he frequented. My first memory of getting a haircut is of a smiling man with a neat beard and Daddy sitting next to me, telling me “Not To Move An Inch”. To this day, I can’t relax and get all chatty with a hairstylist because my entire brain is hardwired with my father’s voice telling me “Not To Move An Inch”. And so I won’t by God! I remember the inside of this fine establishment as a crowded and rather dingy place, which means it must have been tiny indeed given my toddler’s perspective. Anyway, as soon as we got in the door, Dad would head straight for the glass counter and ask me for my preference. I was three, my nose barely reached the part where the metal ended and the glass began. I couldn’t see a thing but I did enjoy breathing on the tiny bit of cool glass that my face could reach, and looking thoughtful. Eventually, I would place my order Strawberry!!! And Dad would place his Vanilla!!! If he was feeling adventurous, he would switch it up to chocolate but I think that only happened once or something. That was the summer when my second cousin came back from Dubai and showed us a fancy parlor that both manufactured and sold ice cream that you could order and consume curbside in the luxury of your very own car. My auntie took me there one night and introduced me to my first falooda. And my life was never the same again. 😀 But that is to fast forward. Back in our Old West Ice Cream Parlor, we were being served ice cream. Not scoops or scones, but slabs of it. There’s a small part of me that still thinks of waffle cones as exotic because my lizard brain thinks ice cream is naturally served as slabs on cheap white porcelain plates. Good times though! We would sit there solemnly consuming our ice cream, until Dad had scraped his plate clean and I was still sitting there with half of mine on my plate. My mother was bringing me up to share so I always asked him if he’d like some of mine. My father, meanwhile, was bringing me up to not share eatables with him so he always refused. He would then sit in silence, watching me make heroic attempts to finish the entire plate before taking pity on me when I was about three-quarters through and proposing we leave. It was powerful magic, for an undemonstrative man and his willful daughter. And like all magic, it was contained to that moment in time. These days, I tell my dad he should get a pedicure and take him out for coffee. That is our thing now, I push him to try and move an inch while he lets me order unfamiliar items off the menu. It’s a different kind of magic but one thing remains the same: we have a standing date anytime either one of us cuts our hair. ROFL.. dads will be dads.. i mean they r soooooooo way too good with us.. Excellente!! I think Girija ma’m will be more than happy to see you writing. I remember how much she would poke you for not getting humour in a story. And now I only see humour flowing brilliantly through your posts! Well written!!! Hilarious is all I have to say. So absolutely rightly you placed the incidences. Keep writing. Reminds me of my childhood too. But I cant put it down like you do. Your HAIR!!! I remember how much you cried the whole night near the stage at acharya niwas when you had a bad hair cut. I am ROFLing. you were such a nautanki-queen back then. I think even shibu was around and he suggested you see a psych for the over-drama. LOL. hahahah…yeah yeah..senti-psycho joke we cracked over me cryin.. hahaha.. i ws actually soooo dumb re..i rem every part of my childhood..those wr the best days..n tu bhi kam nahi thi..how much you cried the day i banged your cycle to the banyan tree 😛 hahah.. Exactly!! Ohair is simply the best sistah..u gotto try it to believe it! !